From the Bali files. This is the front end of a teensy Doto nudibranch, feasting on a hydroid. There are thousands of species of nudibranchs (aka sea slugs), and they come in a kaleidoscope of colours and patterns. Big nudis can be up to a foot long. 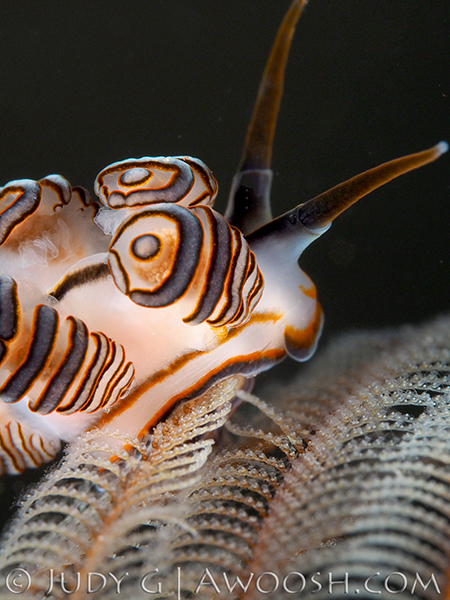 This little beauty (Doto greenamyeri for all you nudi geeks out there) was about 1/3 of an inch in length. Those horn things (rhinosphores) are how they smell/sense. Shot with a 60 macro lens and a +10 diopter, plus a whole lotta cursing . This entry was posted in All About Scuba Diving, Indonesia Travel, Photography, Pic of the Day and tagged Bali Diving, Doto greenamyeri, Doto nudibranch. Bookmark the permalink. Was in richmond for golf recently and play the best ball with Jim W his wife Sue and their girls were on a different team. It was set up by Tim Moreton and he said I should check out your site 🙂 I’ll give the short story, my daughter and I are planning a dive trip to do Myanmar (Burma) aboard the Smiling Seahorse dive aka MV. Thai Sea, leaving from Ranong Dec 20/17. We have not been there and do you have any reports you could share. Hi Gord, I have not yet been to Myanmar, so don’t have a report to share. Try Scubaboard in their Asia directory. And have a great time!